I first saw John Bulmer’s work in a copy of Hotshoe magazine a few years ago. While I liked all of the images featured in that issue, one in particular has stayed with me. The image was made in the town of Nelson in Lancashire while Bulmer was on a commission for Town Magazine in 1960. Shot in black and white it shows us an old lady, in threadbare clothes and leather boots that look so heavy I wonder how her stick thin legs can lift them. She is hunched over, at her feet a bucket peeks from behind a wall; with a brush in her right hand she scrubs her gatepost. If I were forced to list my top ten all time favorite photos, I think I would have to put this one on the list. I always think of it when I visit my hometown. I’m not really one for nostalgia, I’m sure the past was never as rosy as people like to make out – but when I think back to my childhood – my memories of where I grew up are distinctly different to what it is like now. Of course everywhere changes in one way or another, but I walk the streets of that town and am saddened by how little care people take of the place they live, the place that I lived. Many of the houses look uncared for, people dump unwanted furniture: beds, sofas, tables on street corners, gardens that were once filled with flowers have been concreted over – to be used as driveways, overflowing bins spill out onto the pavements and there are cars everywhere, far more than there used to be. There were always decent sized gaps between the cars so that my friends and I could play street cricket after school. Now you hardly ever see kids playing in the street. Anyway, that’s enough of the Wonder Years. I just wonder why it is that some people seem to not care about, or take pride in the environment that they and others live in. Does it really take that much to consider those that live around you? Just think how nice a lot of places would be if all those that lived there took care of their small patch, just for the sake of others, if not for themselves. I guess it’s a reduced version of act local think global. And lets face it, as my grandmother used to say ‘soap, water and elbow grease don’t cost very much’. Which takes us back to that old lady in John Bulmer’s photo. 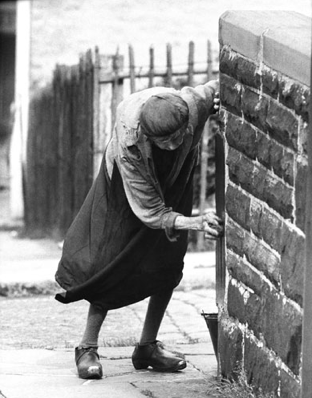 She was out scrubbing her gatepost.